Manchester City Centre. 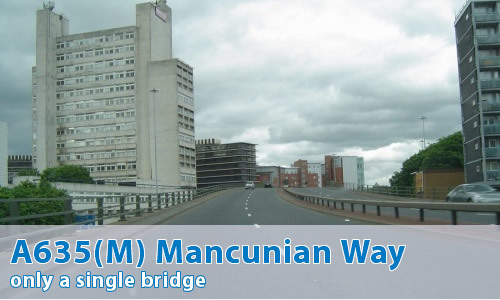 It forms a small part of the southern part of the Manchester and Salford Inner Ring Road. This was the shortest motorway in the United Kingdom between its opening in 1992, and 2016. And there's no sign of its existence on any map or signpost yet found. No sign of its existence? Are you making this up? Is it April Fool's Day?? How on earth did you find out about it? Well, I have to confess that it wasn't me. Well, it all came out of a chance remark Paul Berry made on SABRE, on a thread entitled "A635(M) Anybody?" Paul's comment was that given that the A57 leaves the A57(M) at the eastern roundabout, then logically the flyover must be A635(M). To my eternal shame, I thought that no, it wasn't, just that was the layout of the junction. Therefore, Paul's slightly flippant question came to present us with a motorway that none of the good people of SABRE (nor myself) had ever heard of! A new, truly pathetic case. Oddly enough, they've been available as part of the A57(M) Photo Gallery for some time now, just that I didn't know it! In addition, David Jones has sent in this photo of the entire motorway. Can you comment? Are there any to make?